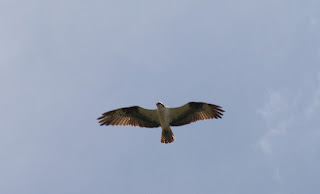 Rock Paper Lizard: Look, another Osprey! Or perhaps it's the same one as last year. I was cycling through Garden City Park and saw the large raptor flapping above the slough in the northeast corner of the park. It looked as though it might land somewhere over there, so I rode through the forest, hoping to get a perched picture. No luck, the bird had disappeared. If you live or work in that part of Richmond, watch for it flying above the pond, which seems to contain a healthy bullhead population, enough to keep a piscivorous bird interested. Note the crooked wings, overall paleness, and black "wrist spots." If you see it, be sure to shout, "Look, an osprey!" And see if you aren't then the crazy person. Most people are so busy looking at their feet, cell phones, Ipods etc that you really do need to yell..Look it's an Osprey...or they'll miss it. Did you see my red bird today? My friend was yelling "look at the red bird" My kind of people. Carol, Many still won't see it. Perhaps if it were texted to them. Yes Deb, I saw it. I sure would have yelled too, but I would have yelled "Tanager!" which would have made no sense to almost everyone else. You could point up and say, "Look, Michael Jackson!" That would get everyone to look. I am often viewed as a crazy person, I'm sure, but I would not feel confident to ID this bird or even pronounce it if I could (oss-pree or oss-pray??). Glad you saw it, though. I hope you stopped your bike before taking the photo!